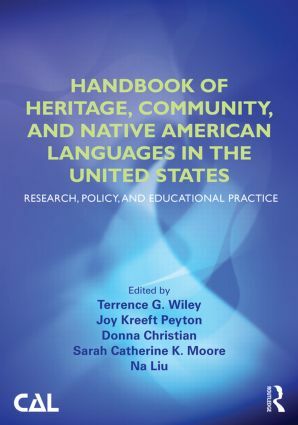 Timely and comprehensive, this state-of-the-art overview of major issues related to heritage, community, and Native American languages in the United States, based on the work of noted authorities, draws from a variety of perspectives—the speakers; use of the languages in the home, community, and wider society; patterns of acquisition, retention, loss, and revitalization of the languages; and specific education efforts devoted to developing stronger connections with and proficiency in them. Contributions on language use, programs and instruction, and policy focus on issues that are applicable to many heritage language contexts. Offering a foundational perspective for serious students of heritage, community, and Native American languages as they are learned in the classroom, transmitted across generations in families, and used in communities, the volume provides background on the history and current status of many languages in the linguistic mosaic of U.S. society and stresses the importance of drawing on these languages as societal, community, and individual resources, while also noting their strategic importance within the context of globalization. Terrence G. Wiley is President, Center for Applied Linguistics, USA and Professor Emeritus, Arizona State University, USA. Joy Kreeft Peyton is Senior Fellow, Center for Applied Linguistics, USA. Donna Christian is Senior Fellow, Center for Applied Linguistics, USA. Sarah Catherine K. Moore is Senior Research Associate, Center for Applied Linguistics, USA. Na Liu is Senior Research Associate, Center for Applied Linguistics, USA.